As I mentioned earlier, we moved over the summer. We just wanted a quieter community and found a house and a neighborhood we really liked about an hour away. It was sad leaving our first home but we are excited to be in a new house. And I will stay busy decorating the rooms for a while, so I'm excited about that! In the first two weeks of living here, we tried to cram in as much as possible because we were having a lot of family visit for my sons baptism. So I got to work! I tried to prioritize things that would have the biggest impact on the house. Mainly, the floors and walls. The room that required the least amount of work was the dining room. Everyone who saw the pictures of the house loved the red walls and I was like, uh, sorry guys those are the first thing to go. In the before picture you can see the fading in the floor from a previous area rug, so we had some floor guys come over and sand and re-stain the floors before we moved anything in on the first floor (you can see the test spot the floor guys used to see what kind of wood we had). I spray painted the chandelier with brushed bronze and added some Edison bulbs. 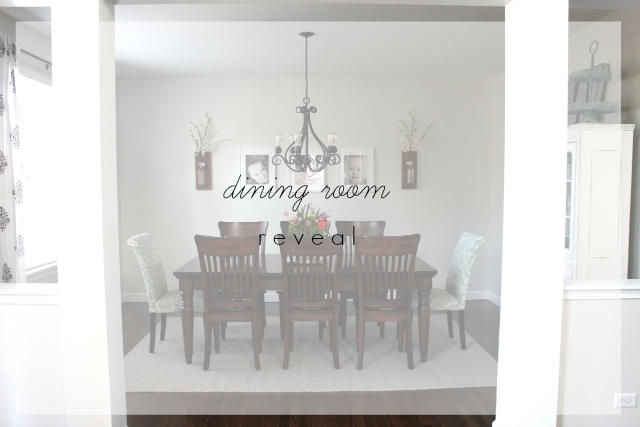 I used the same decor on the dining room as in our last house haha. It looks so familiar-but my husband really liked it, and I didn't have a better idea, so we kept it. I also spray painted the curtain rod and got new curtains and a new rug. I just love this hutch and think it's my favorite piece of furniture. I bought it from a friend, so it's fun to have a little history with it. I wanted the room to be bright and clean-since it's a room that won't be used all the time. I love having at least one room in my house that is (mostly) clean at all times. This room is it. I also think this room is the most similar to the rooms in our previous house. Which is probably why this was the first room done!